I was craving something hot, sour, salty, yet sweet. I thought of the Korean style buckwheat noodles smothered with spicy chili sauce would calm down my craving and it did. There are many ways Koreans prepare buckwheat noodles into fabulous dishes. Here is one way you can enjoy. The flavor in the sauce will dance around on your tongue. It truly is hot sour salty and sweet. 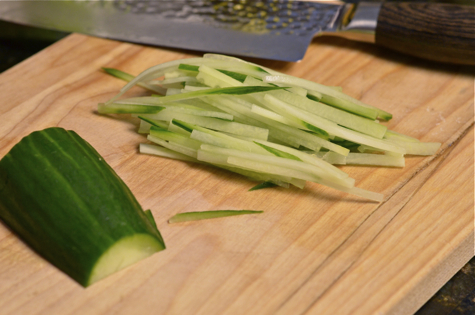 You can throw some fresh cucumbers, carrots, and/or lettuce depends on your mood. My baby radish kimchee was in its most glorious stage these days so I added some (you don’t need to). The best part? It only takes a few minutes to prepare. Love it! 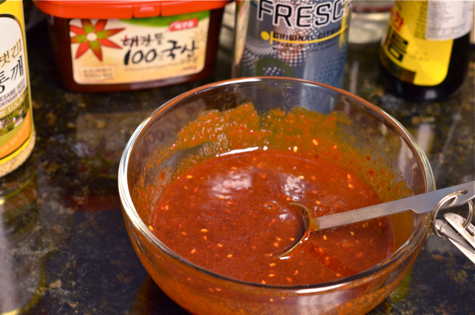 The ingredients are; buckwheat noodles, Korean chili paste, chili flakes, brown sugar, vinegar, sesame oil and seeds, corn syrup(optional), carbonated citrus drink (I used Fresca), dried roasted seaweed and cucumber. You will want to make the sauce first. Combine all the given ingredient. The consistency is somewhat like thick syrup. You can adjust amount of sugar and vinegar depends on your taste but you will like the amount I give you. 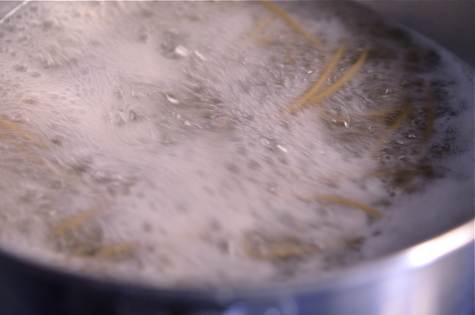 when the water comes up to boil again after you add the noodles, pour 1/2 cup of COLD water to the pot. This will calm down the boiling water and help the noodles to be chewier. Repeat that again when the water comes up to boil again. Rinse the noodles in the cold running water and drain well. Slice cucumber, carrot, cabbage or whatever that make you happy for topping in the dish. My baby radish kimchee is a perfect companion for this dish (traditionally) but it is not mandatory. 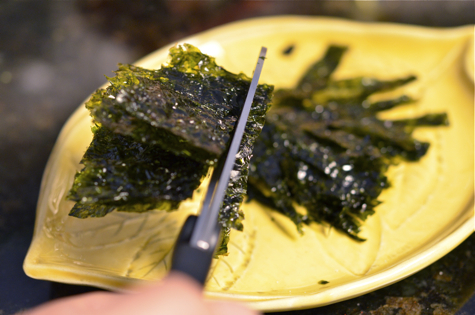 You will like the addition and the flavor of this dried roasted seaweed. Just crumble or slice into small pieces. Place the noodles in a big serving bowl, top with vegetable. Drizzle the sauce over and mix with chopsticks. I like to add half boiled egg on the side to include protein for this meal. We had a few emergncy visit to doctors this past several days. Life gets busy and hectic sometimes but I do enjoy the lovely spring. Spring does bring the green beauties of the earth along with pollens. Stay health and stay happy. Make the sauce and let it chill in the fridge. Meanwhile cook buckwheat noodles according to the package direction. 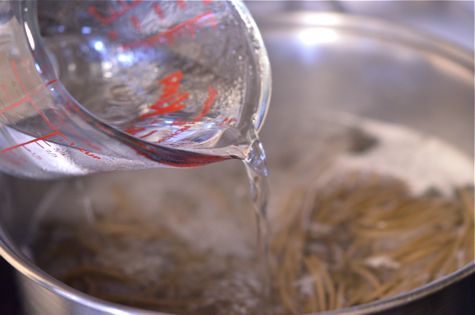 (After you add the noodles to the boiling water, pour 1/2 cup of cold water when the water boils up again. Repeat the process until the noodles are done) Rinse noodles with cold water and drain. Place noodles in the individual serving bowl and top with vegetables, drizzle with sauce, about 1-1 1/2 Tbsp per serving, and mix well. Serve boiled eggs on the side. Hmm I love spicy cold noodles! Can't wait to try your recipe. Thanks for posting it! I'm recently married and moved to another state far away from my mom & am missing Korean food so badly. Just wanted to let you know that I'm glad to have found your site and the recipes so that I can recreate some dishes at home with clear, tangible directions (since my mom never measures when she cooks)! Thank you! i never knew that trick about cooking soba noodles to make them chewier! Awesome. Thanks for sharing that tip. Your photos always make the simplest Korean dishes look gourmet. I learned that trick from Chinese cooking their dumpling in boiling water. It does help noodles to be chewier. Honestly I don't measure anything when I normally cook, either. I only do that on the food I post on my blog. Sometimes that is the hardest part on Asian food blogging I think. I also don't usually measure when I'm just cooking at home, but when my mom tries to share her recipes with me it's usually, "just put enough in till it looks right" or "until it tastes right". Since I'm not familiar with cooking Korean food myself, it just leads to me becoming more flustered. Carbonated citrus drink is an interesting addition. I had something similar at Korean restaurants never knew they added that! Missed your food! This one looks great for a comfort food. Is the noodle same with Japanese soba? Yes, It is soba noodle. I am always happy when I see new noodle recipes because I am a rice and noodle lover :)! 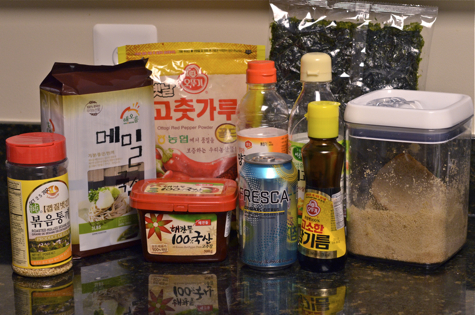 I just stumbled upon your blog and I am so happy to find it because I love Korean foods...! I am sure I will try some of your recipes soon :). I am a huge fan of cold noodles! Love this recipe :) Thanks for sharing. This is such a wonderful combination of flavours and textures and is so satisfying! And it's so fast and easy to throw together. Do you have anymore buckwheat noodle dishes that you are planning to share? I love your blog! I lived in South Korea for one year and I really miss and crave the food, and the smells and flavours of it sometimes. I'm so happy to have found another blog that has such an amazing collection of well-written and beautifully photographed Korean recipes. Thank you! Thank you Anna. 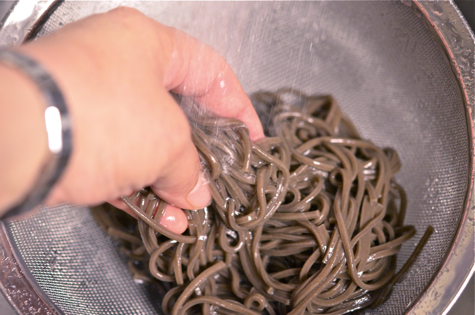 I will keep in mind to post more buckwheat noodle recipes since I love them too. Could I make the sauce for the noodles ahead of time and leave it in the fridge for a few days? Would it still taste good? Thanks, I love this recipe! Of course! You can make the sauce ahead of time and keep in the fridge. It will last fresh for couple of weeks or even longer. This recipe is excellent esp. 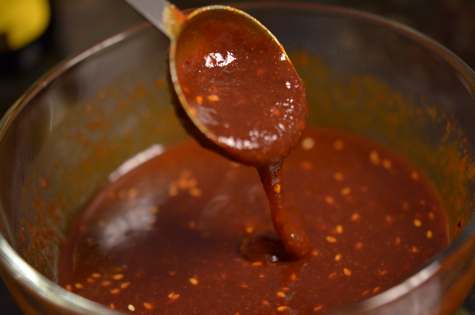 the sauce for the noodle. Kimchi is great with it too ! Oh my goodness - this looks so good! No Thanksgiving left-overs for me; I am making this on Friday! Thank you, Holly!